The lodge at Vade Mecum Springs dates to the 1890s. 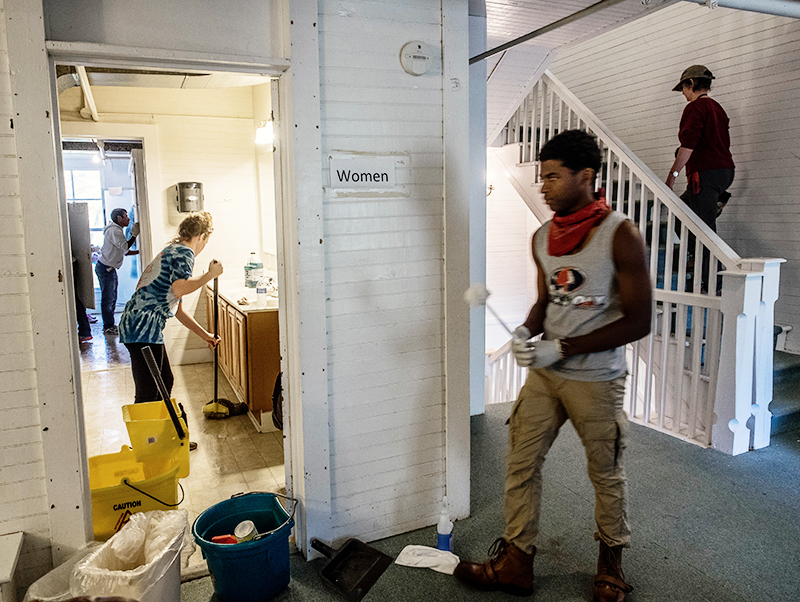 Armed with dustpans, mops and enthusiasm, volunteers descended on the Vade Mecum Springs property at Hanging Rock State Park Saturday, the first of several workdays organized by Friends of Sauratown Mountains. Students from East Forsyth High School clean the lodge interior. The goal was “to remove at least the top layer of dust” in the central lodge and begin upgrading rough trails on the 716-acre property,” said Ranger Austin Paul, who guided the volunteers. They also began the tedious job of hauling away more than 100 old mattresses from the lodge and nearby cabins. 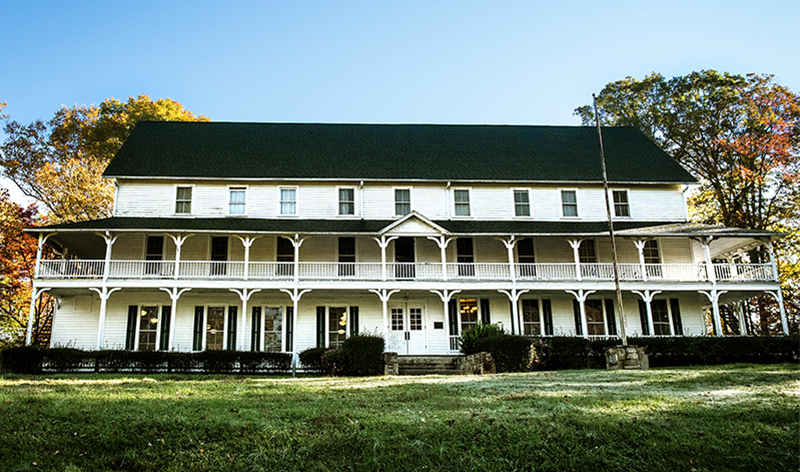 The Vade Mecum Springs property – operated until last year as the Camp Sertoma 4-H Education Center – was transferred to the state parks system from North Carolina State University through legislation. Its operations will be integrated into those of the state park. Along with the lodge and cabins, facilities included a campground complex and access to the Dan River, nine miles of mountain biking trails, a recreation hall, swimming pool, chapel, athletic fields and equestrian barn and trails. Friends of Sauratown Mountains – which supports both Hanging Rock and Pilot Mountain state parks – lobbied hard for the property transfer after the 4-H center was closed in 2013, and immediately began recruiting volunteers. More than 30 signed up, including students from East Forsyth High School in Winston-Salem. 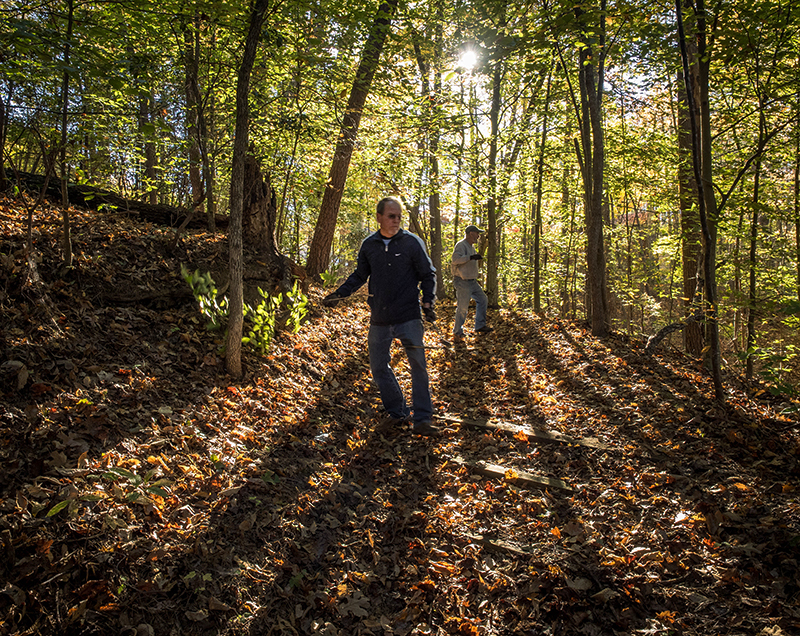 Along with old mattresses, miscellaneous furniture and dust, the volunteers found an old network of hiking trails which never had been accurately blazed or mapped. In early October, park maintenance staff and rangers worked to reopen the popular network of mountain biking trails near the campground. Volunteers begin clearing trails on the property. State parks administrators will complete a detailed assessment of the property and its facilities along with a long-range management plan for reopening those facilities that can contribute to the state park’s mission. The Stokes County landmark has a long history. Entrepreneurs John Sparks and J. Cicero Tise developed Vade Mecum Springs at the turn of the 20th Century as a reort revolving around the healthful Moore Springs. It was operated as a retreat and summer camp by the Episcopal Diocese and Easter Seals until the acquisition by North Carolina State University for its 4-H program. Vade Mecum Springs and Moore’s Springs were two different and separate enterprises. Both had their own Spring and water. Not at this time. There are still extensive repairs to be made. The facility is not ready to be rented out yet. Yes the property is being prepared for events. Contact for details. I attended Camp Vade Mecum as a child more than fifty years ago when it was a summer camp operated by the Episcopal Church. Are any of the cabins and the chapel still standing, and are the grounds open to the public? Several of the structures are still standing at this time. I do not believe they are currently open to the public due to safety concerns, but I will reach out to the Superintendent and get back to you.